According to the Institute on Aging, nearly 43 million Americans are currently caring for an aging loved one over the age of 65. While some of these people have the time and expertise to look after the elderly, many eventually need to consider asking for help. Here is a quick look at six reasons why an in-home caregiver might be beneficial to you and your aging loved one. An in-home caregiver has the knowledge and training needed to keep your loved one safe, happy, and healthy. From managing medications to cooking nutritious meals, you can rest assured a professional caregiver will provide world-class care at all times. 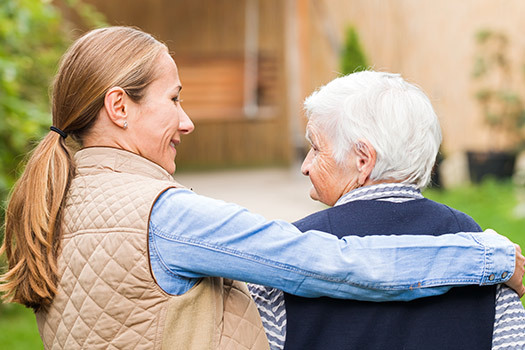 The caregiver can also note changes to your loved one’s physical and mental health, which could help you catch medical issues in their earliest stages. Caring for a senior loved one can be challenging for families who don’t have expertise or professional training in home care, but this challenge doesn’t have to be faced alone. Family caregivers can turn to Montgomery Home Care Assistance for the help they need. We provide high-quality live-in and respite care as well as comprehensive Alzheimer’s, dementia, stroke, and Parkinson’s care. One of the most important jobs of an in-home caregiver is catching emergencies as soon as they happen. You and your family might feel constantly anxious because you are afraid something is going happen to your loved one when you aren’t there. With an experienced caregiver in the home, your loved one can have regular supervision. Unlike hospices and retirement homes, there is an incredible amount of flexibility with an in-home caregiver. You can hire a caregiver whenever he or she is needed, and you won’t have to pay for any services you don’t want. Before hiring the caregiver, you can come up with a personalized plan for your loved one. A recent study funded by the AARP found that over 71 percent of seniors prefer to age in place. Being able to retire at home is much more comfortable than moving to an assisted living facility, and that sense of independence can also boost dignity and self-worth. Seniors who are forced to move out of their homes often feel isolated and unsure of what the future has in store for them. With the help of an in-home caregiver, your loved one can sleep in his or her own bed every night and cook in his or her own kitchen throughout the senior years. After taking care of your loved one for a few months, you might find it challenging to maintain a positive relationship with him or her. Family caregivers often become burnt out, which can result in tense situations and unwanted confrontations. Getting assistance from an in-home caregiver allows you to focus on the relationship instead of menial tasks and daily chores. Caring for a senior loved one can be rewarding, but it can also be overwhelming for family caregivers who have other responsibilities they need to focus on. For these families, the perfect solution is respite care. Montgomery families rely on our caregivers whenever they need time to rest, work, run errands, and even go on vacation. Countless studies have shown how dangerous social isolation can be in the senior years. Seniors who don’t regularly interact with peers and family members tend to experience higher rates of depression, anxiety, and other disorders. In addition to interacting with your loved one every day, the caregiver can also help him or her get out of the house to socialize. If your aging loved one needs help managing the tasks of daily living and you’re searching for a reliable, expertly trained caregiver, Montgomery, AL, Home Care Assistance is your top choice. At Home Care Assistance, our caregivers strive to make aging in place a safer and more comfortable experience for seniors so they can enjoy their golden years in better health. Call (334) 593-3988 today to find out how we can enhance your loved one’s quality of life.